Follow the instructions in this article to set up your Parent Portal. The Getting Started tab directs you to this section of the Help Center. The News & Announcements tab is where you can post news and other important information for your families. This tab is covered in the Parent Portal Communication section. The Settings tab is covered in this article. Customize the information that your customers can access, and the functions you will allow them to perform. Make selections by checking the boxes and saving changes. 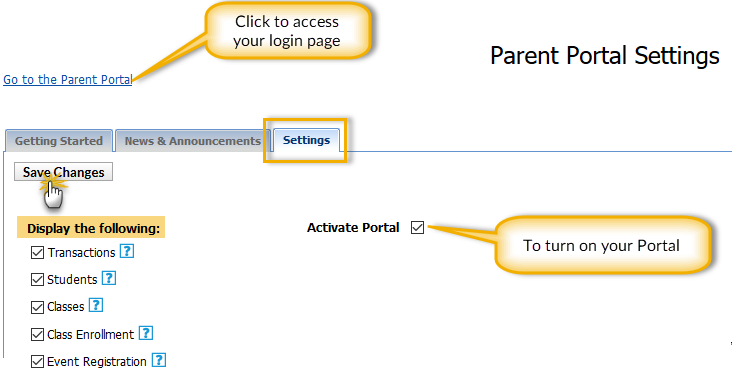 Access your Parent Portal login page by selecting the Go to the Parent Portal link in the upper left. 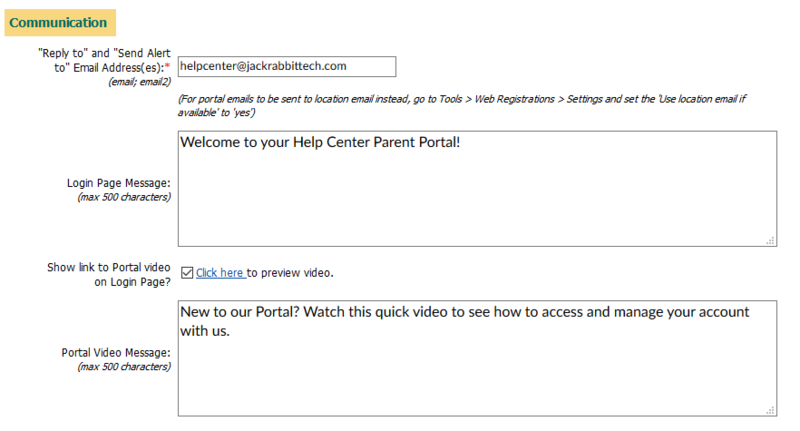 This is a quick way to access your Parent Portal when testing! See our article Test Your Parent Portal for more information. These settings control what your families will be able to see when they are logged into their Portals. 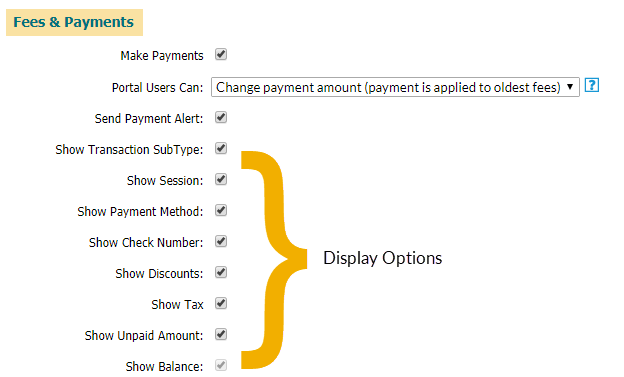 Transactions - Controls what is displayed on the Billing & Payments page. When selected, recent account activity is displayed and the parent has an option to generate a transaction history which they can then sort or filter. Students - Controls whether the Students icon (page) is available. When selected, the parent is able to see a 'card' for each student with summary information and an photo of the student if it has been added in your database. They will be able to click the card(s) to view more detailed information about the student(s). Classes - Controls My Schedule and Enrollment on the Student page. When selected, My Schedule will display on the Dashboard and an Enrollment option will be available on the Student page. Both will display information about the class(es) the student(s) are currently enrolled in. 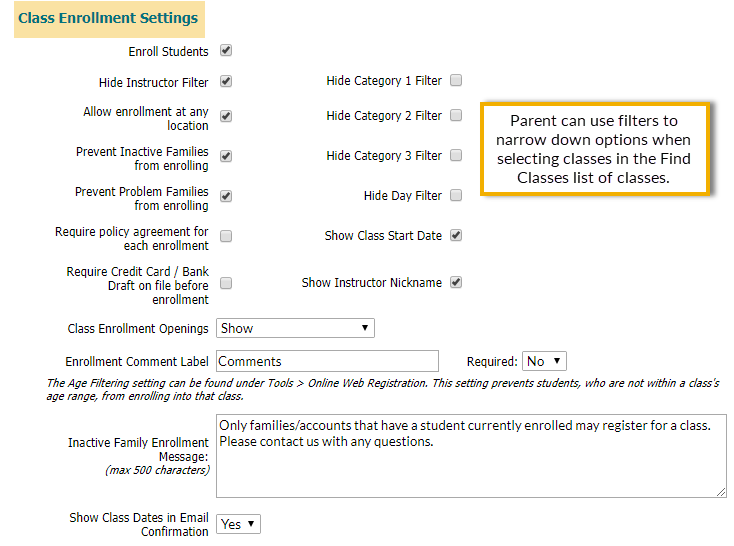 Class Enrollment - Controls the availability of the Classes menu option. When selected, the Classes menu option will allow the parent to search for classes using your class listings. The ability to enroll in a class, however, is controlled by the Enrollment Setting Enroll Student (covered below). If you opt to not allow student enrollment in the Portal the parent will be able to view the class information but will see a message that prompts them to contact you directly to enroll. Event Registration - Controls the ability to enroll in an Event. When selected, the Classes menu option becomes Classes & Events and a Find Events option is available. Parents are able to view and enroll either their students, or the family, in the Event. "Reply to" and "Send Alert" to Email Address(es) - Provide the email address where you want to receive notifications, enrollments, payments, etc. This will also show as the "from" address when customers receive their email notifications. If you prefer the portal emails be sent to the Location email instead, go to Tools > Web Registrations > Settings and set Use location email if available to yes. Login Page Message - Text here (500 characters max) is displayed in a window that is seen by all Portal users. It appears on the Parent Portal login page, before the parent is able to log in. This is a great place to add a welcome message or to add information that you want to broadcast to everyone. This text box supports html. Show link to Portal video on Login Page - When selected, a Watch Video link will be available for your parents to watch a quick (3:03) instructional video on how to access and manage their accounts. Portal Video Message - This text field is only available when the Show link to Portal video on Login Page is selected. Text (up to 500 characters) you enter here will be appear before the Watch Video link and can be used to bring attention to what the video offers. More information on this free video is available in our Help article Parent Portal Introduction / Instructional Video. This section determines what you will allow your parents to DO inside their portal. Policies Agreement Date - Set today's date (during initial set up) or a PAST DATE such as the last time your policies changed, or your most recent past annual renewal date. When Jackrabbit notices that a family has not agreed to the policies SINCE that date, it will require them to re-agree in order to proceed. Do NOT use a future date as it will force everyone to continually re-agree each time they log in, which is an unnecessary annoyance. The Policies in your portal are pulled directly from Tools > Online Web Registration > Agreement Text. To learn how to effectively use the Portal to manage your policies, see the Legal Policies and the Parent Portal article. Update Contact and Student Information - Controls the ability to update phone numbers, email, address, etc. Update ePayment Schedule - Allows the parent to update the family's ePayment Schedule (located on the Billing Info tab of the family record). Update Membership Type - Allows the parent to update the family's Membership Type (located on the Billing Info tab of the family record). Hide School/Grade fields - Option to hide these fields in the student information. Add Students - Allows the parent to add new student information in the portal. 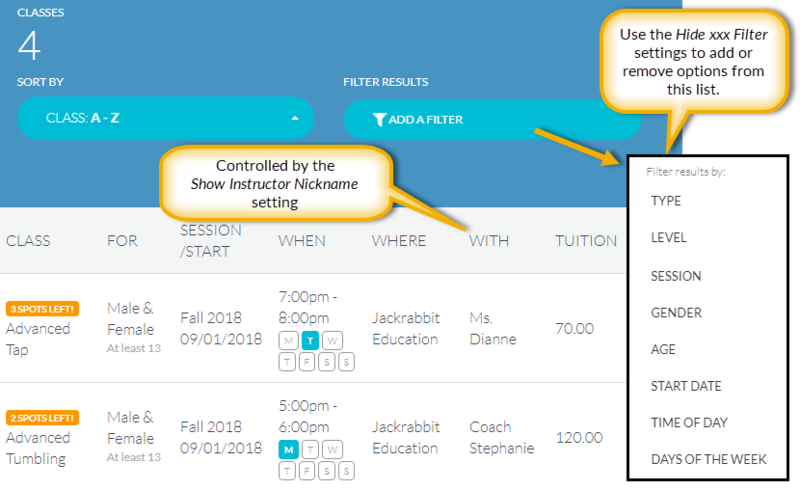 Show Student Skills - If you track skills in Jackrabbit, allow your parents to see the skills and instructor notes in each Student's page. Show Student Absences/Attendance - Controls whether or not student absences/attendance information is available to the parent. Show Attendance Issues - Attendance Issues are when a student has been marked Present and additional details have been added (Late, Left Early, Observing). You can choose to show this information to parents in the Parent Portal or hide it. Define which of your custom User Defined Fields are able to be seen and edited in the portal. User Defined Fields are customized from Edit Settings > User Defined Fields and can be used on the Registration Form as well as shown inside the Portal. Inside your database, the responses are shown on the Misc tab of the Family and Student records. To run a report of all recent changes to these fields, made in the Portal, go to Reports > Parent Portal. Enter a date range and filter for "User Defined Field Changes". These settings control parents' ePayment options in the Parent Portal. Use the display options to add detail to the fees displayed. Make Payments - If you have ePayments set up through a Jackrabbit provider select this to add a Pay Now button and allow families to proactively submit payments online. Portal Users Can - Select a payment mode from 4 options that determine how flexible you are about what fees can be paid, or if you allow partial payments. These options are discussed in more detail in our article Parent Portal ePayment Settings. Send Payment Alert - Select this checkbox to have a payment alert sent to you when a parent makes a payment in their portal. Show (display options) - The next 8 choices control what data is displayed for a fee in the transaction history of Billing & Payments. Registration Fees (Annual Fees, Session Fees, etc) cannot be posted through the Portal. Visit the Post Annual Fees article to see how to manage Registration Fee postings for your existing families. These settings control what information is displayed in the class 'cards' seen in My Schedule (Dashboard) and when you view the student, under Enrollment. 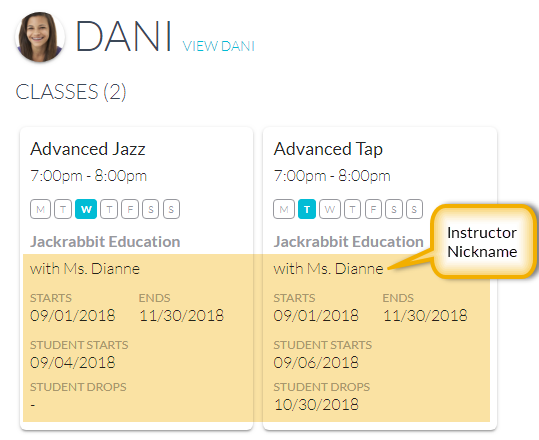 To have the Public Nickname field of an instructor's Staff record display in the class 'cards' in the Parent Portal, set Show Instructor Nickname to Yes. When set to No, no information about the instructor will display. Typically this is the student's enroll date. However, if the class hasn't started, the class start date will be shown instead of the student's enroll date. If a Future Drop has been scheduled for a student you can choose to display it. 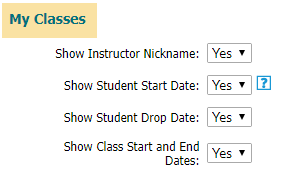 The date that a class starts and finishes, as defined on the Summary tab of the Class record, will display if this is selected. Enroll Students -Select to allow parents to enroll students in classes and events in the Portal. Hide Instructor Filter - Allows you to hide the option to filter classes by instructor in the Find Classes class listings filter drop-down. 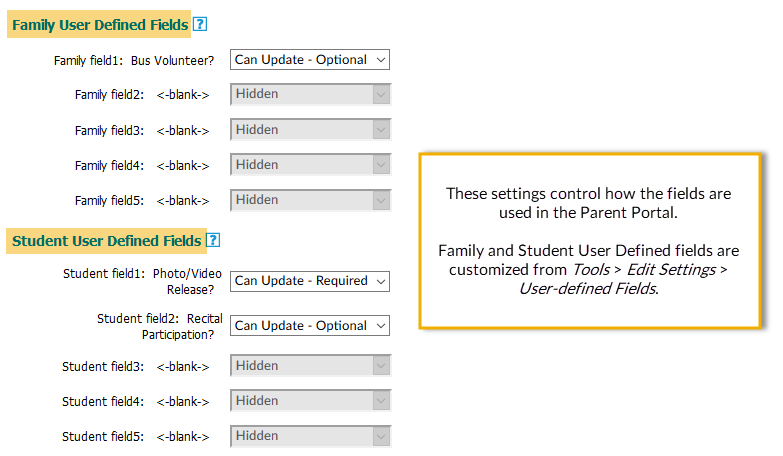 Allow enrollment at any location - Select if you have multiple Loc codes and will allow families from one Loc to enroll into classes in a different Loc. Prevent Inactive Families from enrolling - Select to prevent inactive families (no actively enrolled students) from enrolling in classes. Prevent Problem Families from enrolling - Select if you want to prevent families that are flagged as problem accounts from enrolling. Require policy agreement for each enrollment - If you want your policies re-agreed to EACH TIME someone enrolls, select this checkbox (usually not needed). Require Credit Card / Bank Draft.. - If you want to require credit card or bank drafts before allowing enrollment select this checkbox. Class Enrollment Openings - Show the number of openings in the class or hide the count from the class listings. Openings for classes that are nearly full are highlighted in orange. If you will be using online Waitlisting, we recommend that you do not hide the Openings column. Enrollment Comment label - Use this text field to ask a custom question during enrollment. The answer will appear in the email notification you receive. It will also be archived in the Portal enrollment. Define whether this is required or not. Inactive Family Enrollment Message - ONLY use this when you have also selected the 'Prevent Inactive Families from enrolling' above. Text (500 characters max) entered here will display to an inactive family if they attempt to enroll. This message should indicate why are you currently blocking Inactive families from enrolling. Show Class Dates in Email Confirmation - Do you want the email confirmation that the parent receives to show the Class Start and End dates? Set this to NO if you use perpetual classes. On the right are settings that control the parent's ability to filter the listing of classes to narrow down their search (the actual columns will still be shown, this only takes away the filtering ability). You can also opt to hide the WITH (instructor) column from the listings by clearing the Show Instructor Nickname check box. You can change the Category labels to words that are more descriptive to your parents. For example, you can rename Category 1 to "Program" or "Type". Go to Tools > Online Web Registration > Settings and scroll down to the Class Enrollment Settings section. (This affects both the Portal and Registration Form display). You can eliminate certain Categories from the drop-down selection list. Example, you may have a Category 1 called "Costume Fees" that you use for revenue reporting only and don't want your parents to see this in the Portal. To prevent non-applicable Categories from being listed as a choice in the drop-down filter list, go to Tools > Edit Settings > Drop-down Lists > Category 1 (or 2 or 3), and check the Hide from customers check box by any Category that you do not want to appear as a filter selection. (This affects both the Portal and Registration Form display).